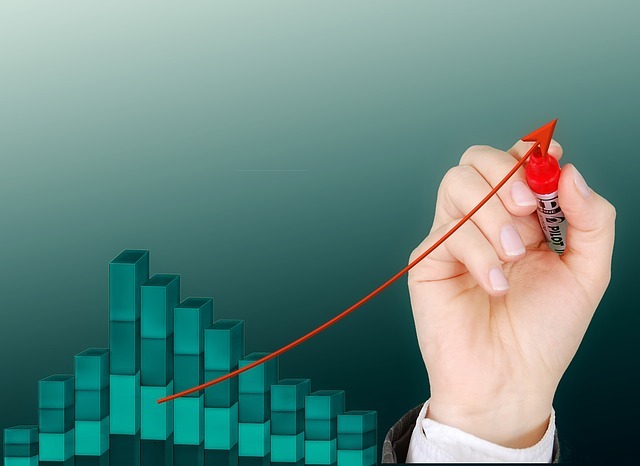 According to a new report from WMG (at the University of Warwick) and Reshoring UK, UK companies believe that both direct and indirect re-shoring of manufacturing can boost business performance. 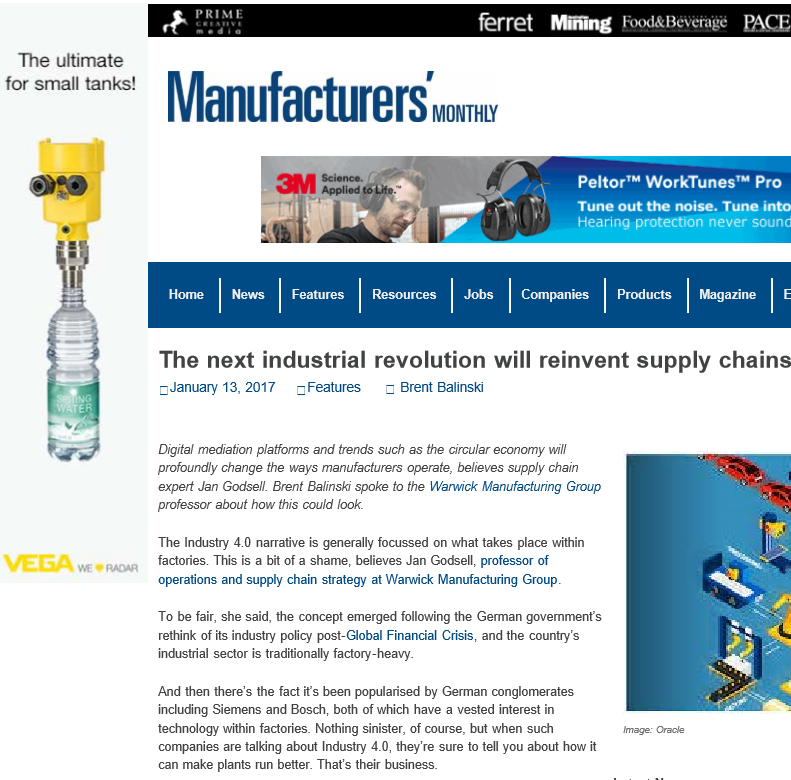 Demand for products and services ultimately drives supply chains. As the demand pattern for products varies, so does the supply chain. Digital mediation platforms and trends such as the circular economy will profoundly change the ways manufacturers operate, believes supply chain expert Jan Godsell. 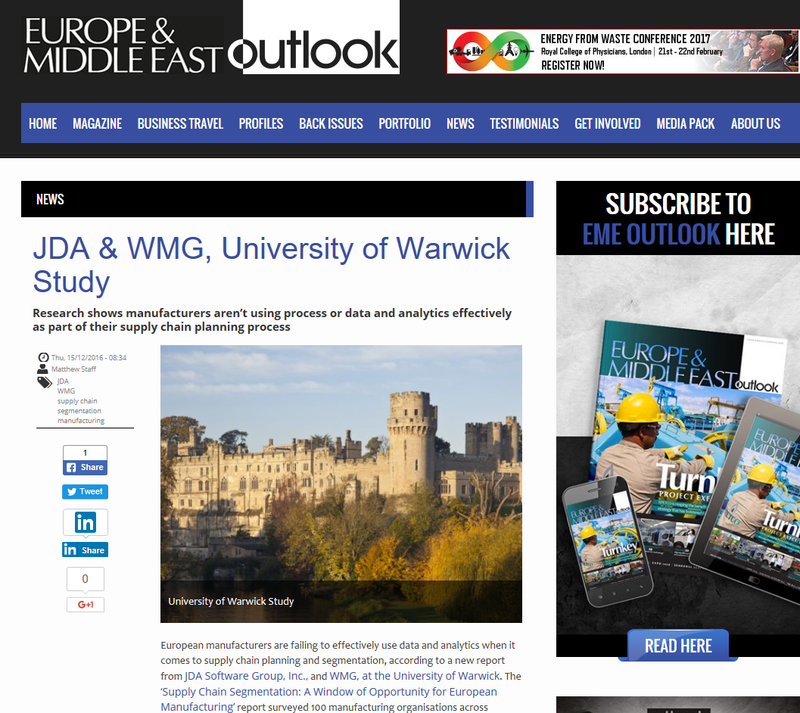 Brent Balinski spoke to the Warwick Manufacturing Group professor about how this could look. 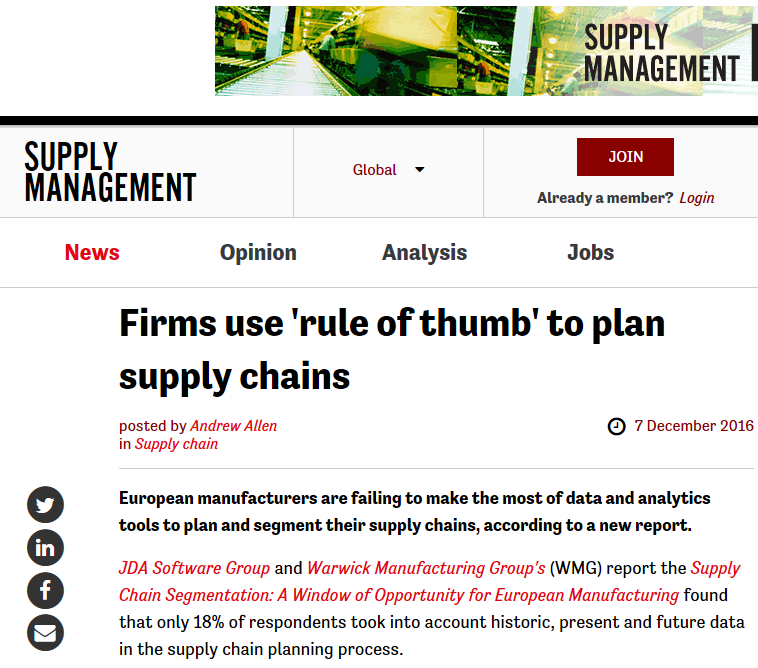 European manufacturers are failing to effectively use data and analytics when it comes to supply chain planning and segmentation, according to a new report from JDA Software Group, Inc., and WMG, at the University of Warwick. Research shows manufacturers aren’t using process or data and analytics effectively as part of their supply chain planning process. 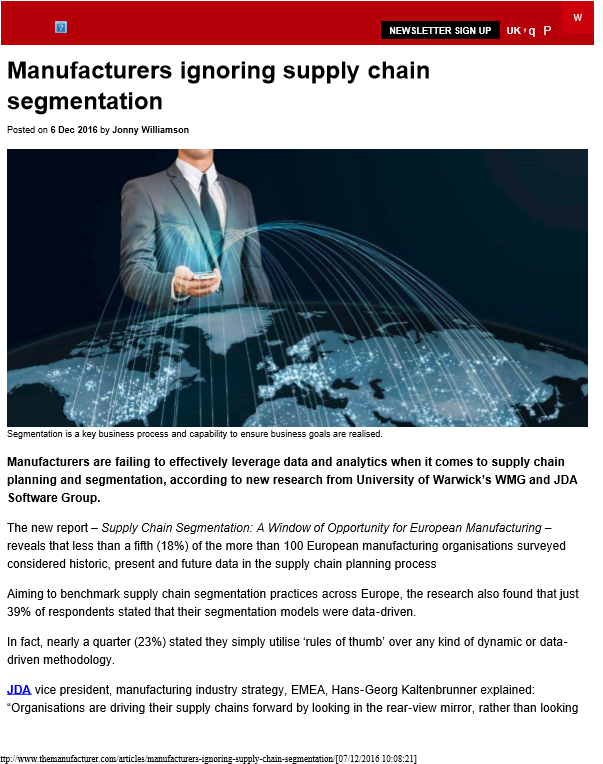 European manufacturers are failing to effectively use data and analytics when it comes to supply chain planning and segmentation, according to a new report from JDA Software Group, Inc., and WMG, at the University of Warwick. 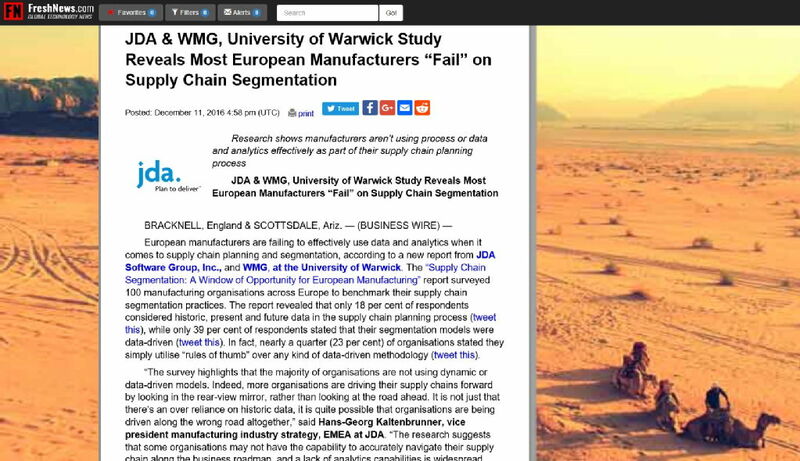 European manufacturers are failing to make the most of data and analytics tools to plan and segment their supply chains, according to a new report. Professor Jan Godsell told a meeting in Cookstown that shoppers should be prepared to go back to eating seasonal food. Supermarket multi-buy offers are "immoral" because they encourage waste. Buy-one-get-one-gree (bogof) deals lure shoppers into wasting money. The UK defence industry is on the cusp of fundamental change. It has the opportunity to adopt a more supply chain-orientated way of working that will benefit everybody - if it can leave some of its historic practices behind. 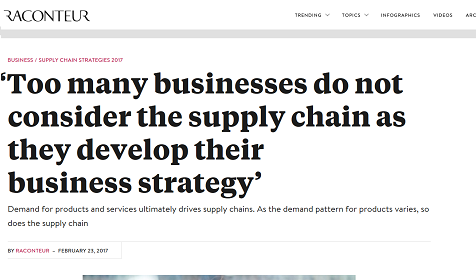 "People think the only benefit you get from supply chains is cost reduction. That's rubbish!" Do we really want to become the 're-shore nation'? Simplistically, off-shoring is a term used to describe the shift from local production to production in a more global setting. Off-shoring was driven by a desire to reduce production costs, predominantly due to lower labour costs. What we are essentially seeing now is a shift back to local production; manufacturing returning to the UK. But why? What’s changed? In their pursuit to survive the fierce competition created by the global economic down turn businesses face the apparently conflicting challenges of driving growth through innovation whilst simultaneously reducing costs. Whilst it has been long recognised that ‘one size does not fit all’ businesses have been slow to adopt the principles of SC segmentation critical for the simultaneous delivery of cost leadership and differentiation.